Making homemade liquid hand soap is an enjoyable and rewarding process! Some people get interested in making their own soap as a fun activity. You may like to make your own liquid hand soap so that you know exactly what ingredients are in it. 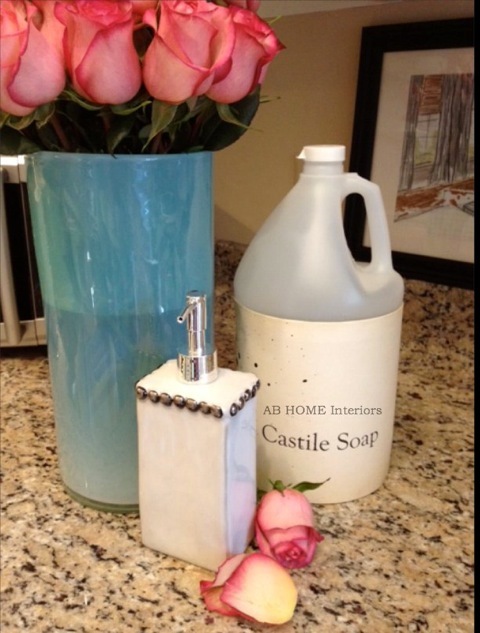 Or you may want to try a liquid hand soap recipe as way of choosing to go green. Whatever the reason- here is fun, easy hand soap recipe for first time soap makers! Choose a favorite unscented Castile bar soap like Kirks Natural, Dr. Brommer’s, Dr. Woods , or homemade Castile bar soap. With a grater, grate the Castile soap bar (a soap made with olive oil) into soap flakes into a large bowl. Try to get 2 cups worth. Heat the water and soap flakes on low/medium heat. Add in the 1/4 lemon juice. Add 30 drops of an essential oil like Lemon Verbena or tea tree oil. I also like to combine essential oils like lemon and spearmint. Experiment with what you like. That was pretty much it! Now you just have to let your homemade liquid hand soap cool and then store in a jug for future use. I keep my liquid soap stocked in old vinegar bottles or laundry jugs and use it as a liquid soap refill to fill old hand soap pump bottles. This liquid hand soap recipe is biodegradable and phosphate free. You can use it as a homemade liquid hand soap or add it too homemade soft scrubs and handmade all-purpose cleaners. Do you think you will make this liquid Castile soap recipe? Is it easier than you thought it would be to make your own homemade liquid hand soap? 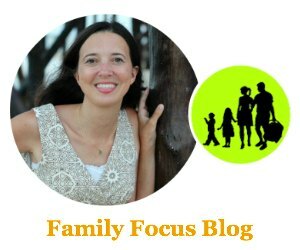 Guest post by Amanda Burdge who owns and operates her own design firm, AB HOME Interiors here in Brentwood, TN. 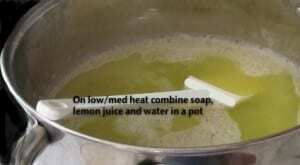 You may also like to read this Homemade Laundry Soap Recipe.